07/02/17 – Large quality screenshots from Spanish release cover added! 22/06/14 – News item scan added thanks to Ross Sillifant. 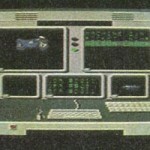 1985, and Ocean were becoming the biggest UK C64 games company with its popular titles with Martin Galway’s fine music. 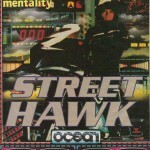 Ocean, trying to dominate the market, bought licences to make conversions of some great programs, such as Knightrider, Miami Vice and another called Streethawk. At the time, Ocean were spending ages and ages advertising both Knightrider and Streethawk for all the 8-bits. No games were to be seen, apart from eventually Knightrider. 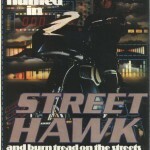 It is believed that there were two versions of Streethawk in development – with Gary Knight being behind the first game started in 1985. 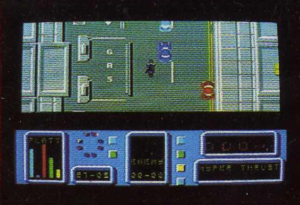 Gary Knight was apparently one of the developers behind Knightrider, and after the poor delays and outcome of that game – Streethawk was brought in house to be completed. We hope to hear from Gary Knight soon about the first version and possibly separate our entries once more as we know nothing about the game. As the game was massively delayed, some impatient developers decided to poke fun by releasing a hacked version of Night Driver with Streethawk graphics and a custom loading screen. It was nothing official or one off like the Crash special that was done. The new version (of which you can see in the screenshots) was started from scratch in 1986 by Colin Gresty and Steve Wahid, whilst Paul Owens re-did the Spectrum version after a terrible rushed job for mail order subscribers. It is not known currently if a C64 version was meant to have been done for mail order subscribers, or if this was just limited to Spectrum owners. Colin was well known for his C64 game Comic Bakery, and this was his next assignment at Ocean. 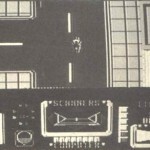 The 1986 game on the C64 was to be an overhead view where you had to foil liquor store robberies and stop kidnappers. But if you did too many things wrong, the police would be after you, so you would have to use your turbo boost. For the liquor store scenes, you saw a view like from binoculars where you would aim a cross-hairs at the villains and shoot them. Martin Galway was also a key part on the game and created a set of cool tunes based on the Tangerine Dreams “Le Parc” theme for the series. Two sets of tunes were recovered back in 2003 for the Project Galway collection You can now download the actual SID tunes, thanks to the guys at HVSC. 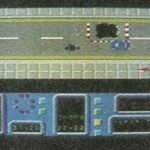 The first version is believed to have been for Gary Knight’s version of the game – built upon in 1986 for the new version that Colin Gresty was producing. Martin Galway talked about his tunes in his Project : Galway CD booklet, and mentions that Colin Gresty was working hard on the game, and working very enthusiastically on the game, with some nice graphics by Steve Wahid. It got to about mid-1987, when all the game’s graphics were complete, but Colin was still trying to finish the programming. It seems there may have been many problems trying to get the game going. Ocean were furious with the huge delay (The Spectrum and Amstrad versions were out and selling), and decided that they couldn’t make a profit no longer from the C64 conversion, because it had taken too long. They scrapped the C64 conversion. The game got to a 90% complete stage, which is a shame. In recent times, GTW has managed to track down Colin Gresty, thanks to Martin Galway’s help. Colin had some very interesting things to say, and even details what the game was to be like. 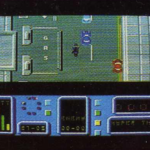 We now know that the game was to be 8 directional scrolling, almost like GTA possibly. Looking at the screenshots extracted over 1985-1986, you can see a lot of differences – Colin suggested that many tweaks and changes were made to panels and areas over the time, and these show this process. Colin also confirmed what we didn’t want to hear, that he no longer had any of the source code to hand. Paul Hughes however came to the rescue and dug out what is believed to be the last remaining copy of the Streethawk source code. We successfully have so far extracted these from the disk, but unfortunately another snag is that we are missing all of the graphical assets. So we now have a pretty much 90% complete set of source code, all of Martin’s tunes and SFX … and just the graphics to slot in to create a complete game. The plan is to now keep trying to get hold of Steve Wahid and locate the graphics. Paul also suggested he may have these as well somewhere, and will continue to look for us. If all doesn’t go to plan – then we will see about making the code available and possibly someone could finish the game off. “As for changing the graphics, well the code should just assemble out of the box and run – just that there would be garbage in place of the sprite and character memory – all you need to fathom is where the code addresses the sprites in order to work out what frames need to go where. Could we really find this once and for all? “I didn’t take over from anyone, I started coding from scratch, Steve Wahid, as far as i remember, started the graphics from scratch. If you look at the screen shots of what is called v1 and v2, the graphics are the same in both versions. I am not sure where the idea of a c64 v1 of streethawk came from, but i never saw one, nor did i use anything else as a basis for my code. 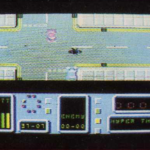 The game was an eight way smooth scrolling top down view of a city scape with traffic moving intelligently all over the map. Damage to the bike needed a trip back to the secret base (denoted by an “H” on top of the building in the scrolling view) before you were caught by the cops/baddies for repairs and reloading/refueling etc. There way an automatic analysis computer that brought up a “3D” line drawing of the bike with markers showing where damage had occured, and the player had to use the computer to repair the faults. The games objective was to fight crime and save citizens etc. Thats more or less it, the game wasn’t finished really because I spent too much time tinkering. At that stage in my career, I hadn’t really got an Idea how to finish a game, i.e. I had no project management skills, so I just kept tinkering. Julian Rignall talks to Colin Stokes, formerly part of the old Imagine. 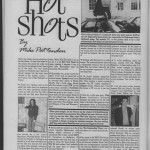 (Small extract of article focusing on Street Hawk). “The burning question: what on Earth happened to Knight Rider and Street Hawk? ‘With a conversion you designate three months, give or take a few weeks, and unless there is a major bug found, twelve weeks usually suffice. Now, the game was started in-house and the guy spent three months, then four, then five. Now, what do you do as a commercial company? We’ve said that it was going to be the first of the month and now it’s two months late and hasn’t appeared. What happens is that you have to gear your advertising to the date that the programmer tells you. You go up and book X amount of space in magazines, and you’ve got the programmer sitting there and you say, “do you promise that the game is going to be finished by then?” and he says, “no problem”. What are you supposed to do? There are only a limited amount of carrots that you can dangle in front of them. Now the three months turn into several which doesn’t do the company or our image any good – we’re always very susceptable to this sort of situation. Knight Rider and Street Gawk were the same. 🙂 Well, could there be in fact, GASP 3 versions? C.U 33 page 98 claims game was delivered to a mail order firm under contract from Ocean, but as a platformer.Any truth in this?. Scan added! However, only a Spectrum platformer surfaced – so I wonder if it was just the Spectrum version which the mail order catalog had a deal on. One for ex-Ocean peeps to confirm! Shame that we are seemingly no further forward to seeing this Holy Grail ! Yeah, unfortunately Paul Hughes has not yet found anything of the graphics and artist Steve Wahid has gone underground and not responding to any inquiries. One possibility is to try and compile what we have and get it running, then attempt to recreate the graphics to get something working once more. If Steve’s graphics did eventually turn up, then maybe we could then just drop them in at a later date. If I had enough money, id pay them to finish it to get this 30 year itch out of my system !! I found Street Hawk on gamebase 64. This version is different than screenshots above. It’s seen like it’s Night Driver with sprites changed and put Street Hawk intro in it. Hi Robin – unfortunately that is a well known hack that was done back in the day. Nothing official. I’ll mention it though in the write up! Cheers!